An analysis of where in Los Angeles we might find Perry's office. The method used will be triangulation of known landmarks. Exhibit 1 Episode 25. Looking out the balcony window we see the upper parts of City Hall, the tall building left of center, and the Los Angeles Times building, near center with the horizonal rows of windows. Note how the right edge of the City Hall tower just about lines up with the left edge of the Los Angeles Times building. This is our first sightline. 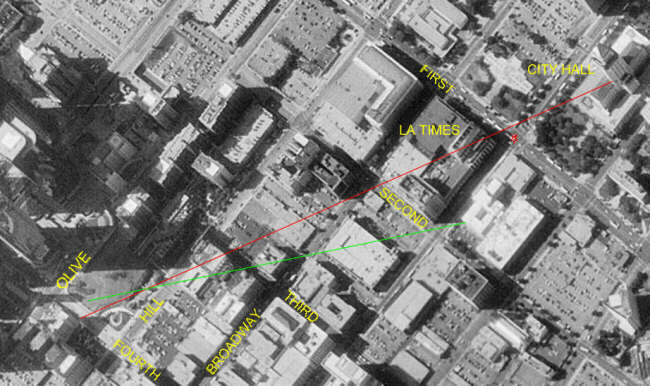 The edge of the tall building seen to the right of the Los Angeles Times building is our second sightline. Exhibit 2 Episode 54. A better view of building to the right of the Los Angeles Times. With its distinctive tower it can be identified as the Metropolitan Water District building on the corner of 3rd and Broadway. It's seen here from behind. The first floor of this building, on Broadway, houses the Million Dollar Theater. Exhibit 3 An aerial photo (click to enlarge) of the neighborhood from 5/31/94 courtesy the USGS and TerraServer USA. North is up. Resolution is 1 meter. Click for a full-sized view. The first sightline is in red and is the most accurate. The second is in green and is less accurate. It's distance to the right of the Los Angeles Times building is just a guess, but it gets us in the ballpark. Where these lines cross is the approximate location of the camera that took the office view photo. In the 50s, there were buildings along that side of Hill street. The area was a hill rising to the west. Hill street, get it? The building the red line crosses at 3rd and Hill is a parking structure. 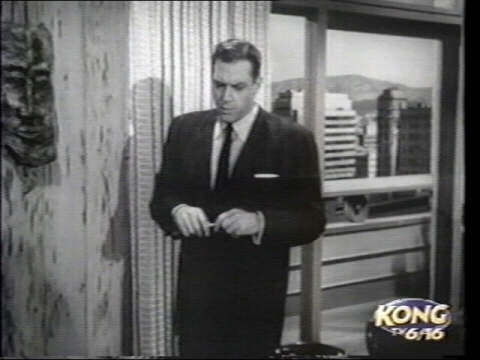 At the time of the Perry Mason show, it was the seven-story F. P. Fay building. The building that the green line crosses just south of there is the Grand Central Market. 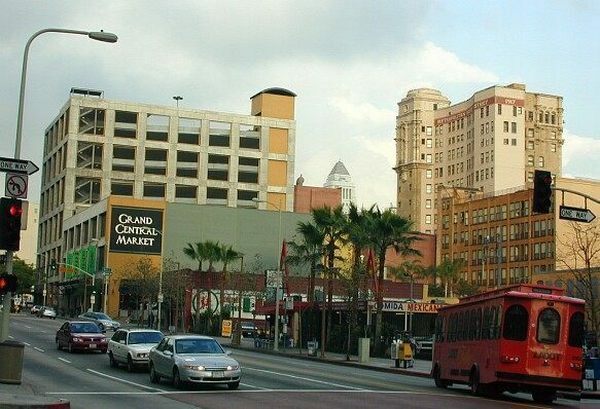 To the left of the intersection of 3rd and Hill, on the south side of 3rd, is the location, at the time of the show, of the famous Angel's Flight funicular railway. 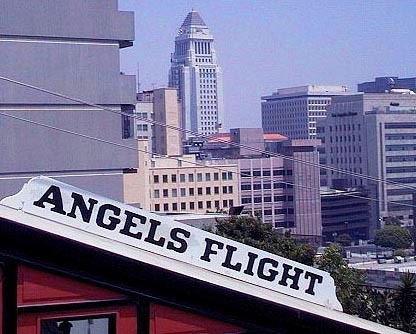 In episode #262, The Case of the Twice-Told Twist, the opening scene takes place at the top of Angel's Flight, near the Olive street terminal. It's a night scene. As Perry parks his car, a darkened City Hall can be seen in the distance. The view is to the left of that seen from the office. During the scene, there are some nice shots of the railway in action. Unforunately, Perry and Della apparently are not on their way to the office. That would be too good to be true. Thanks to Susan at the Della-Perry group for pointing this scene out. Angel's Flight was removed in 1969. Some years later, it was reconstructed a half block south. It reopened to the public in 1996. Exhibit 4 A photograph taken from about halfway up the Angels's Flight railway at the new location looking towards City Hall. The Los Angeles Times building is at the right. 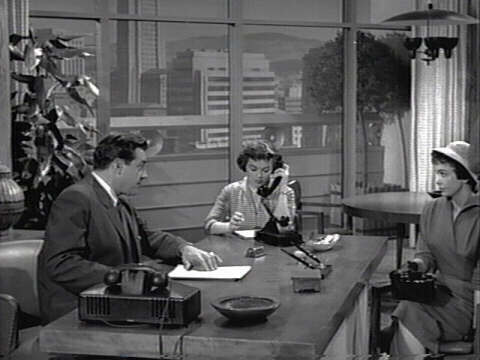 The view is similar to that from Perry's office. Photo courtesy Richard J. Nemeth. Used with permission. Exhibit 5 A view looking north from the southwest corner of 4th and Hill. At the left, the Grand Central Market and it's parking structure. At the upper right, the Metropolitan Water District building with it's curious tower. In between, the top of the City Hall tower. The office view photo was probably taken a bit north of here from about 100 feet up. Photo borrowed from Los Angeles Attractions 3 at the Los Angeles A World Class City site. The Metropolitan Water District building has been renovated and is now known as the Grand Central Square Apartments (entry at 306 W. 3rd Street). The Million Dollar Theater, located on the Broadway side of the building, is closed but remains a cherished Broadway landmark. Well, thanks to an email from Joe Hartley, it looks like the building from whence the office view picture was taken has been indentifed. It was probably the Black Building located on the north corner at Fourth and Hill. This is near where the red and green lines cross in Exhibit 3 above. The full story, with pictures, is here. A Bit of Downtown History: Tour of the Subway Terminal Area Pictures and discussion of the area along and around Hill street. Los Angeles A World Class City A great site with lots of information about the city including Grand Central Market and Angel's Flight. Angels Flight and Third Street Views of and from Angel's Flight in 1900. The view looking down 3rd street shows the Fay building across Hill on the right.